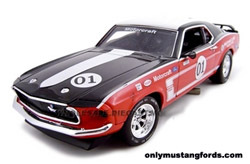 Check out these awesome diecast 1969 Boss 302 Mustang cars. The largest on the net and the best the selection of colors,scale choices and detail. Whether your favorite Mustang legend is a dynamite Calypso Coral, slick Grabber Blue,or decked out in full racing colors, you'll find these 1969 Boss 302 Mustangs here. More detailed information including prices, can be found by clicking the blue links. Looking right at home on the Laguna Seca road course or in your home, this cool Boss 302 Mustang race car is equipped with a full race paint job, black and red two tone paint and contrasting white stripes in 1/24 scale. If your color isn't red, not to worry. 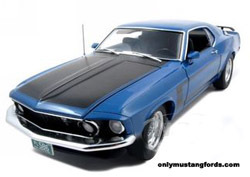 This beauty is also available as a Blue Die Cast Mustang Boss with black in a two-tone paint scheme with White stripes and accents like the red model. Doors, trunk lids and hoods open to reveal the cars nicely detailed interiors and of course the race-ready 302 cubic inch V8 engine, custom cold air intake and ducting. 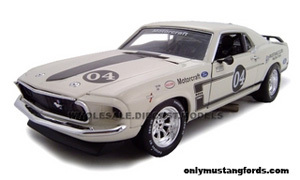 Here's a sweet 1/18 scale 1969 Mustang Boss 302 outfitted with a deluxe interior and cool racing wheels. Nicely detailed, it includes opening doors, trunk and engine compartment, with racing gauges, a fire extinguisher and dual snorkel air intake in 1/24 scale. Complete with a console, deluxe interior and space saver tire, this detailed Acapulco Blue 69 Mustang Boss is a sure winner. Looking suspiciously like a rare Black Jade Boss 302 fastback, this diecast beauty comes complete with the correct front and rear spoilers and the optional and cool rear window louvers. Oh, and of course some tasty Magnum 500's on those jet black tires. Here's a link to the newly added RC Mustang section, which includes a ridiculously fast 2012 Boss 302 rc Mustang.